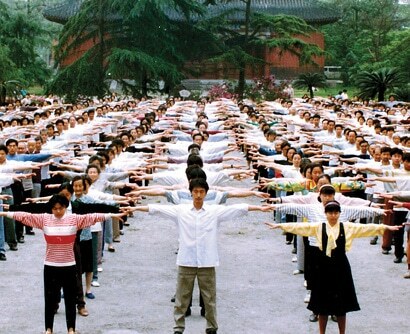 A MORNING STRETCH: Residents of Sichuan province perform the first exercise of Falun Gong. Millions in China discovered the powerful health benefits of the practice in the 1990s. For Carrie Dobson, simply climbing out of bed was a struggle. Much less getting dressed, or making it through the day. Half her body had lost sensation. The Pennsylvanian’s life was being defined by a condition she had never asked for, or even heard of: Lyme disease. For 10 years the rare, fibromyalgia-like disease had grown progressively worse, to the point of being crippling. “I would have paid anything, or traveled anywhere, to get well. I was desperate,” she recalls. But as fate would have it, Dobson’s solution was right in her own backyard—or park, as it turned out. And it didn’t cost a cent. At the recommendation of a Chinese friend, Dobson discovered a traditional Chinese spiritual practice, called Falun Gong. In a matter of weeks, Dobson had her life back. “Falun Gong was what did it,” says the 56-year old flight instructor, looking a decade younger than her years. “It’s all about improving one’s mind and body,” she says. Today, some twelve years later, Dobson remains cured of Lyme disease, healthier—and happier—than ever. What’s perhaps most remarkable about Dobson’s story isn’t simply it’s unlikelihood (Lyme disease is widely considered uncurable). Most incredible is that her story parallels that of thousands—even millions—of other Falun Gong adherents around the world, particularly in China. Her case is anything but isolated. Dobson’s recovery provides a fascinating window into the health benefits of Falun Gong as well as the explosive growth of the practice in 1990s China—where millions of residents made Falun Gong part of their daily routine. “Chinese people are by nature practical,” says Zhao Ming, a native of Beijing, who now lives in New York and who witnessed Falun Gong’s growth in China up close, practicing it in the park at his university. Falun Gong “worked,” by that account. By the mid-90s, in most every park across China, Falun Gong practitioners could be found performing their trademark blend of gentle, rhythmic qigong exercises and meditation. People reported everything from better sleep and less stress to increased energy, better moods, better digestion, and even recovery from chronic diseases. Falun Gong’s primary text, Zhuan Falun, appeared on China’s best seller lists. Word traveled fast and far, and by 1999 the number of Chinese citizens practicing Falun Gong had reached 100 million—eclipsing even the Communist Party’s membership. But how could a simple program of exercise, meditation, and principled living make for such an impact? What made Falun Gong different? What made it “work”? In the words of practitioners, Falun Gong works on multiple levels, going deeper, as it were, than typical exercise programs or health protocols. “It works on an energetic level,” says Dr. Jingduan Yang, a medical doctor of both Chinese and Western medicine who has studied Falun Gong. Indeed, a central component of Falun Gong is its moral teachings, which complement the meditative exercises. Many say it is the teachings, in fact, that form the core of the practice and that differentiate Falun Gong. It’s the blend of virtuous living, of aligning one’s life with higher principles, and powerful exercises that proves such a winning combination. “It’s more than being free of illness. It’s about being well—really well,” says Ryan Smith, an educator from New Jersey. “I can’t tell you how amazing it is not to live in fear of all the things that can go wrong with you, trying to prevent this, prevent that,” he says.